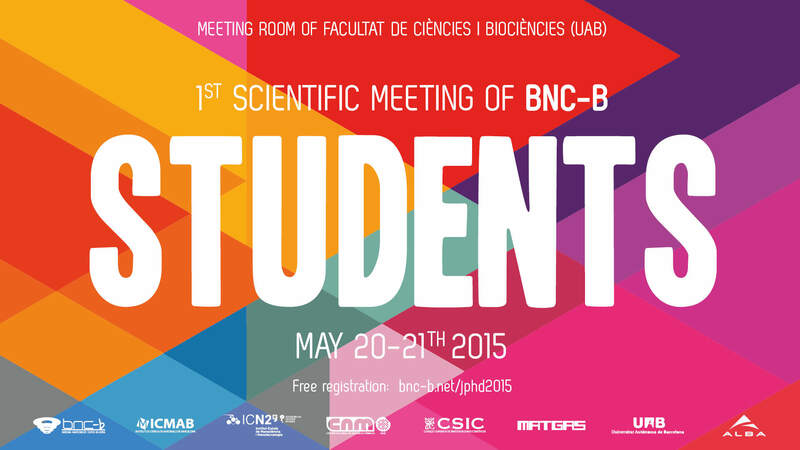 The “1st Scientific Meeting of BNC-b Students” is aimed to present the work done by the PhD students of Barcelona Nanotechnology Cluster – Bellaterra (ICMAB, ICN2, IMB-CNM, MATGAS, UAB, ALBA), promoting the networking between them in an academic and scientific environment. After the successfully previous editions of “1st Meeting of ICMAB students” in 2011, and “1st Meeting of ICMAB-ICN-CIN2 students” in 2013, currently we incorporate all the framework of the UAB Research Park. Moreover, this event is also opened to master and undergraduate students, and the scientific community at large. Furthermore, we will count with different invited speakers to share with us their experience in the entrepreneurship, the skills acquired during the PhD that can be useful outside the academic world, and represents a good chance to meet people who have already follow this path and who can give you a good advice. The meeting represents an outstanding opportunity to gather PhD students, share experience and research from different nanoscience areas, and will favour the interaction and collaboration between young researchers.